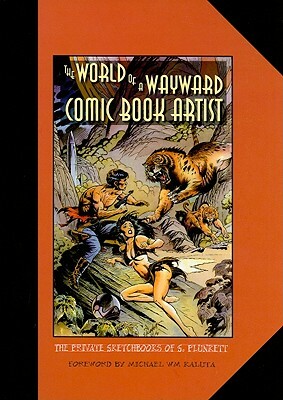 The World of a Wayward Comic Book Artist: The Private Sketchbooks of S. Plunkett is a fascinating look at the creative processes of Sandy Plunkett. A self-taught illustrator and comic book artist, Plunkett came of age in New York City during the ‘60s and ‘70s and began drawing for Marvel Comics at eighteen. Throughout his ongoing career he has drawn for several other major publishers, including DC. Featuring nearly four hundred selections from sketchbooks kept over the past twenty years, this collection is an insightful examination of the difficulties and successes Plunkett has experienced in keeping his work alive and evolving. The drawings cover a wide range of styles and subject matter, though all are rooted in the visual vernacular of illustration, comic, and popular art of America, evincing influences as diverse as Thomas Hart Benton and R. Crumb. Images of creatures, both actual and imagined, fabulous characters, and dreamlike worlds are juxtaposed with studies from Plunkett’s life. The sketchbook images, along with a foreword by Michael Wm Kaluta and an updated interview of Plunkett by Comic Book Artist’s Tim Barnes, provide a fascinating insight into artistic process, debate, and fruition.